Paradoxically, the idea of social justice was historically associated with movements that were suspicious of and uncomfortable with progress. The term was coined by the Jesuit Luigi Taparelli in 1840. His aim was to reconstitute theological ideals on a social foundation. In the century that followed, ‘social justice’ was upheld by movements that were fearful of the future and which sought to contain the dynamic towards progress. Probably one of the best known advocates of social justice was Father Charles Edward Coughlin. This remarkable American demagogue and populist xenophobe set up the National Union of Social Justice in 1934. Through his popular radio broadcasts, which regularly attracted audiences of 30million, he became one of the most influential political figures in the United States. Coughlin praised Hitler and Mussolini’s crusade against communism and denounced President Roosevelt for being in the pocket of Jewish bankers. Here, ‘social justice’ was about condemning crooked financiers and putting forward a narrow, defensive appeal for the redistribution of resources. Today’s campaigners for social justice bear little resemblance to their ideological ancestors. They’re far more sophisticated and middle class than the followers of Fr Coughlin. But they remain wedded to the idea that the unsettling effects of progress are best contained through state intervention into society. They also maintain the simplistic notion that financiers and bankers are the personification of evil. The current Occupy movement would be horrified by Coughlin’s racist ramblings, yet they would find that some of the ideas expressed in his weekly newspaper, Social Justice, were not a million miles away from their own. When Glenn Beck talked about the meaning of the word “progressive,” and about the history of Coughlin and “social justice” all this year and last year, he was dismissed as a fruitcake, perhaps even by the average Spiked reader, assuming they even knew he was talking about them at all. 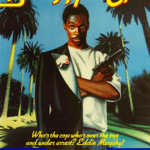 Hell, who ISN’T up for a 4+ hour conversation about ‘Beverly Hills Cop’ (1984)?!? Isn’t Bill Maher supposed to be one of the ‘smart’ people?